Bengali rasgulla is a traditional Indian dessert. It is most popular in Orissa, Westbengal Assam and loved by every Indian. You can make this sweet dish made with cheese in any occasion. It is my all time favorite dish. Here is something one should never forget when it is about Bengali rasgullas, one 100 gm of rasgulla contains 150-180 calories. If you are eating 3 rasgullas then it is about 500 calorie that is equivalent to a full course mill. Take a pan, add milk and bring it to boil. Add lemon juice or vinegar to this boiled milk and stir constantly. You can see the cheese separate from the milk. Turn off the stove and add ice cubes to this cheese. Separate the cheese from this water using a strainer. Hang the cheese with a muslin cloth for about 3-4 hour till all water come out of the cheese. Rub the cheese for a while and make soft dough, this is the toughest part and don’t cheat here. If you don’t rub the cheese finely then it will be really hard after you put them in freezer. Add cardamom powder to the dough and Make round shape small rasgulla with this soft dough. The more you will make the dough soft you will get the nice and sponge rasgulla. Take another pan, add water and bring it to boil. Now add sugar and cardamom powder and make syrup. Boil the water till it become thick. Now take a pressure cooker, add some water and 2-4tbsp of sugar to boil it. Add this rasgulla balls to the boiling water and close the lid to give one whistle. Remove the rasgulla from cooker and put in sugar syrup. Now your Bengali rasgullas are ready to serve. 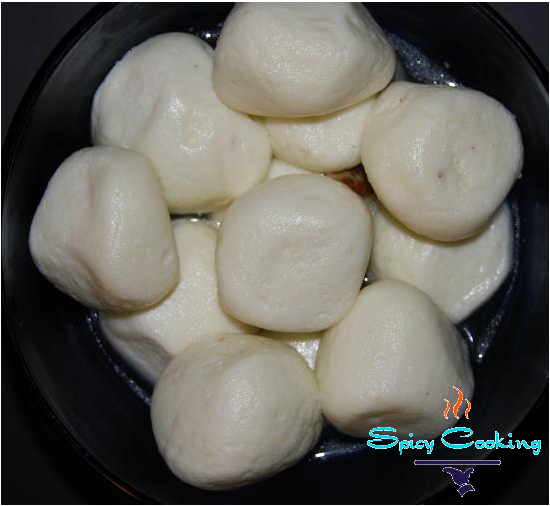 You can serve this rasgulla hot or chilled but best is to eat them when they are at room temperature. If you have any new ideas just feel free to share me here. Actually, Bengali rasgulla is NOT popular in Orissa. On the other hand Oriya rasgulla, which is far better, has the potential to render the Bengali version extinct! Taste is a matter of personal choice, Vercingetorix. And to judge between two sweets - or, for that matter, any dish - that come from two different regions, though the recipe may be identical, one needs to try samples from both the regions, which, no doubt, you must have done. I only wonder, why the Bengali version is not extinct by now if the claimed potential of the Oriya version is so great? For information of other readers, as Vercingetorix must be aware of it, rasgulla (or to pronouce it the Bengali way - rasogolla) was invented by a Bengali, more than a hundred years ago and is still popular throughout India as "Bengali rasogolla/rasgulla". I should have mentioned in my previous post that rasagola (the Oriya pronounciation) originated in Orissa hundreds of years ago, most probably in the Jagganath Temple in Puri as one of the offerings to the deities. The Bengali rasogolla, invented by Nabin Chandra Das of Bengal (in 1868), is the modern version of rasogolla that is found all over India. Rudra: The Bengali version happens to be a simplified version of the original Oriya recipe as reverse engineered by N. C. Das, who then claimed to have invented it. Frankly, nobody even in Kolkata swallow the N. C. Das's BS, who attribute its introduction in Bengal to Haradhan Moira. This oversimplified, tasteless rasgulla never gained popularity outside Kolkata. Elsewhere in Bengal, the rasgulla is prepared faithful to the original Oriya recipe. I have to agree. K C Das sponge Rossogolla is not prepared outside of Kolkata.